For the last two years I’ve been hosting Christmas dinner at my home. I am Muslim so we don’t celebrate Christmas as such, but it is an opportunity for the family to get together because it’s one of the few times of year that everyone is on holiday!! Being British Asian, I do feel Christmas is also part of my culture. I grew up watching my friends celebrating Christmas, we bought the bumper edition Radio Times every year without fail in the 80's and 90's, and circled all the movies we'd be watching over the holidays. It was great fun! I want my little one to have fond memories too, so I really enjoy cooking Christmas dinner - complete with roasties, gravy, yorkshire pudding, sprouts, roasted veg and juicy roast chicken. Not traditional I know, but prefer chicken to turkey. One of my specialties is making yummy non-alcoholic eggnog. This easy peasy and creamy spice-infused milky drink so delicious!! Great as a Christmas mocktail for all non-alcohol drinking folks, and perfect for pregnant mummies. It’s become a tradition to have this every year when we have the family over. I haven’t posted it before as I feel I’ve spent the last two years perfecting it. And, boy can I tell you it has been perfected! 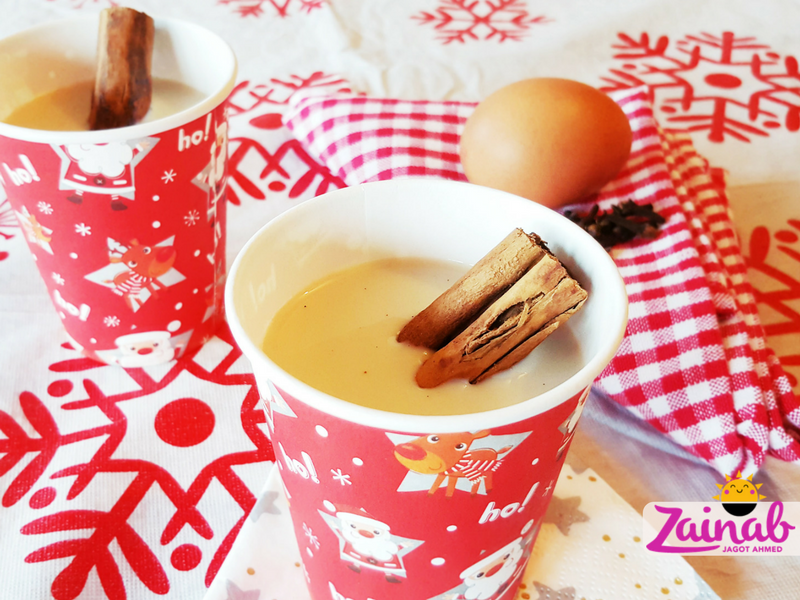 Made with warming spices: cloves, cinnamon and nutmeg, it's wonderful for health and boosting immunity. These fragrant spices also smell like Christmas and are perfect for this cold time of year. I have a big family so this recipe is what I call a ‘batch cooking’ recipe - enough to serve my Big Fat Indian family. If you have less guests you can scale down the quantities. Lovely to serve as a welcome drink on entrance with some yummy canapes. Pour the milk into a very large, deep pot and pop in the cloves, cinnamon and all of the condensed milk. Give it a stir and bring to the boil gently on low heat. This will take up to 20 minutes (possibly a bit longer) due to the volume of milk. While the milk is gently heating, place the egg yolks in a bowl and add the sugar. Whisk well until combined and the texture is light. Once the milk is gently simmering, add one tablespoon of milk at a time to the eggs and whisk quickly to avoid the egg cooking! The process is called ‘tempering’ and is to help bring the eggs to the same temperature as the milky drink simmering away in the pot. Continue adding one tablespoon at a time until the temperature of the egg and sugar mixture is the same temperature as the milk in the pot. Then pour the egg and sugar mixture into the main pot a little at a time, not forgetting to whisk. When combined, add the nutmeg and vanilla to the pot and stir. Continue to simmer on low heat for 5-10mins. Give it a little taste to make sure the sugar amount is perfect, then switch off the stove and allow to cool. Once cooled, pop it back into the milk container/ bottle you poured the milk out of - you may need a funnel to do this, or pop it in a large container and pop it back in the fridge. On Christmas day take it out of the fridge a couple of hours before serving and pour it into serving glasses. Or like me, you can pour it into a large punch bowl and serve with a ladle. Easy to serve as a welcome drink, or for your family/ guests to help themselves.